Every summer (it's been 15 years now!) we head to the Eastern Sierras to our favorite place on Earth, Hot Creek Ranch, for some family and fishing time. I love this area beyond words. The giant, expansive, as far as your eye can see, vistas are beautiful, and I find them to be calming and relaxing. Besides fishing, we spend a few days exploring the town of Mammoth and the Mono County Lake area. 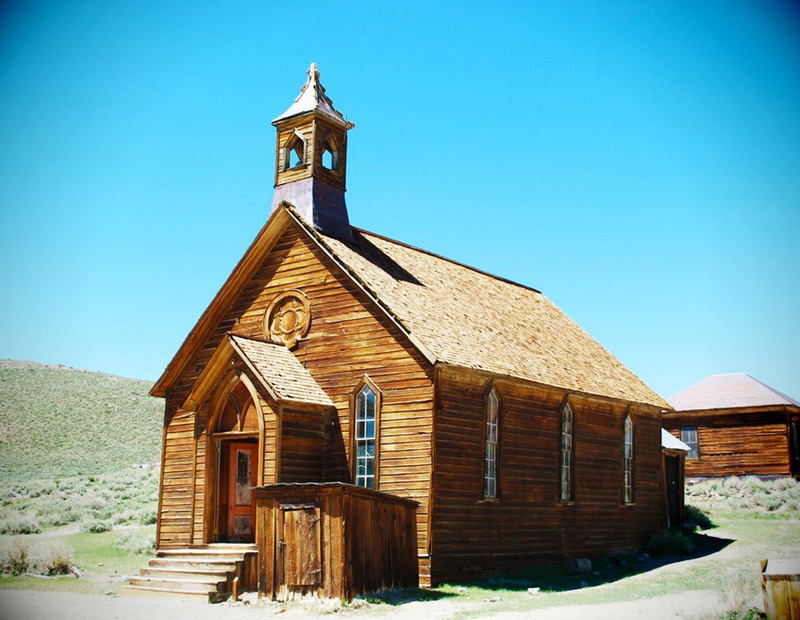 In our rotation of sites-to-see is Bodie, a mining ghost town and California State Historic Park. It's described as a "town frozen in time" and in a "state of arrested decay". By all accounts, it was a rootin'-tootin', tough-as-nails place to live. If violence or illness didn't strike, the inhospitable climate and weather would surely find you. The wind alone would drive to me to distraction, up to 80 mph, and the winters are unimaginable. Driving into Bodie is quite an experience. It's a bit like waiting in line for rides at Disneyland. You travel along thirteen miles of winding road enjoying the scenery and wondering what's around each corner. Abruptly, you are met with four miles of unpaved and very rough road. Winds kick up the dust impacting visibility so much, you are forced to stop (take a look at the collage photo in the slideshow). Once the dust settles, in front of you is Bodie - or the remains of Bodie. It's an interesting, if unintended, clearing your mind for the experience ahead experience. Once you're out and about you'll encounter huge pieces of mining equipment are strewn about the landscape, buildings still standing on their own accord, and a beautiful church waiting to hold a Sunday mass. Venture a bit off the beaten path, you'll find a cemetery where the hard living conditions of Bodie is evident. What strikes me most while wandering through the streets is the variety of decaying and weathered textures and the beautiful colors and patterns they create. I easily get separated from Doc and D while they move along and I'm photographing odd details. IF YOU GO: You'll only find bathrooms and a few garbage bins near the parking lot. That's all this park has for ammenities. So, be prepared and bring food, snacks and water. It's also windy as all get-out here, bring jackets and sunglasses. Sunscreen and camera highly advised! A favorite destination of ours is the Japanese Tea Gardens in Golden Gate Park. Doc and I visited the gardens frequently during our brief courtship, and now the three of us continue the tradition. D loves imaginary play, so this spot provides endless scenarios. The usual, though, is ninja vs. samurai, inspired by Jack and Annie from the Magic Tree House series. 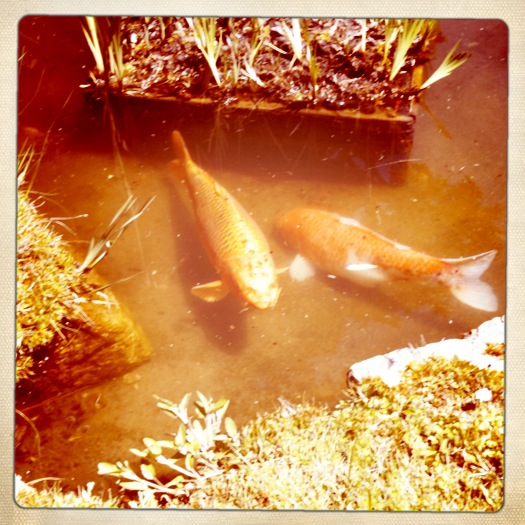 I have so many pictures from the Tea Gardens, but I thought I'd share these that were taken with my iPhone and the Hipstamatic application. While the tea service isn't traditional or authentic in the least, it's nice to relax and chat and take in the view over a pot of tea and fortune cookies. 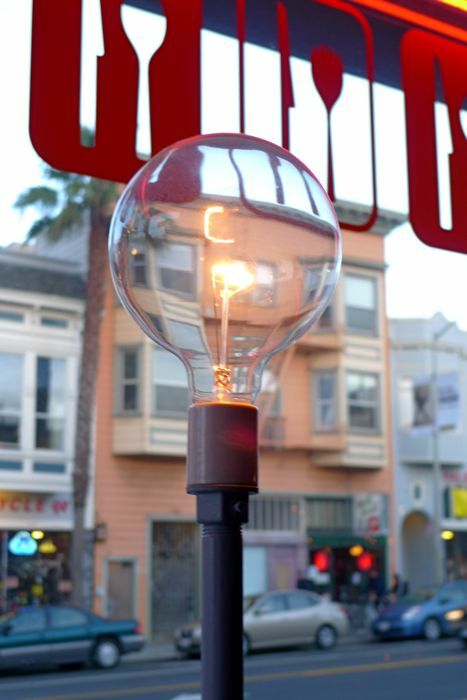 TIP: SF residents receive a discount if you show your I.D. Of course weekends are busiest, especially if the weather is nice. If possible try to sneak in during the week when school is out of session and make a day of it by visiting the DeYoung and the Academy of Sciences. It seems like summer weather has arrived in SF. This year was particularly cold and foggy. I attributed our gloomy summer to our new geographic location, but it truly was a colder than usual summer. So when the sunny, warm weather arrived, we headed down Highway 1 to Moss Beach, or the Fitzgerald Marine Reserve. 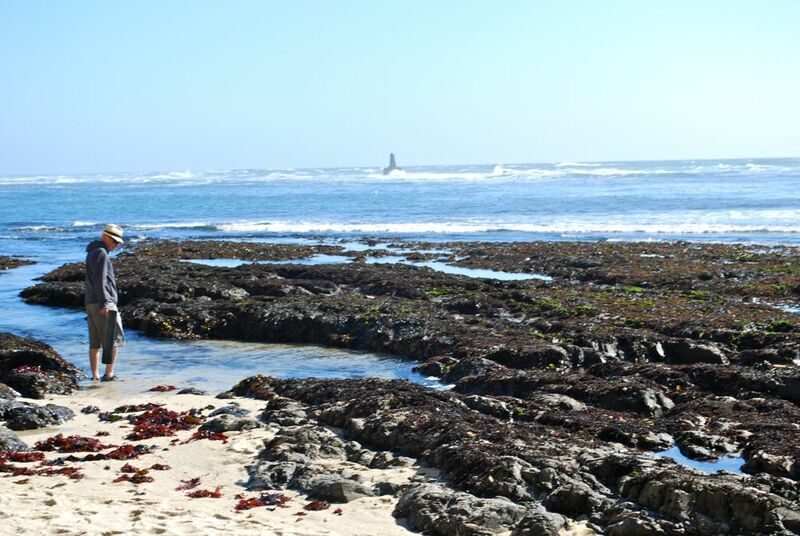 As a teenager we use to come here to play and explore the tidepools looking for the biggest sea anemone, various starfish and batfish, sea urchins and hermit crabs. 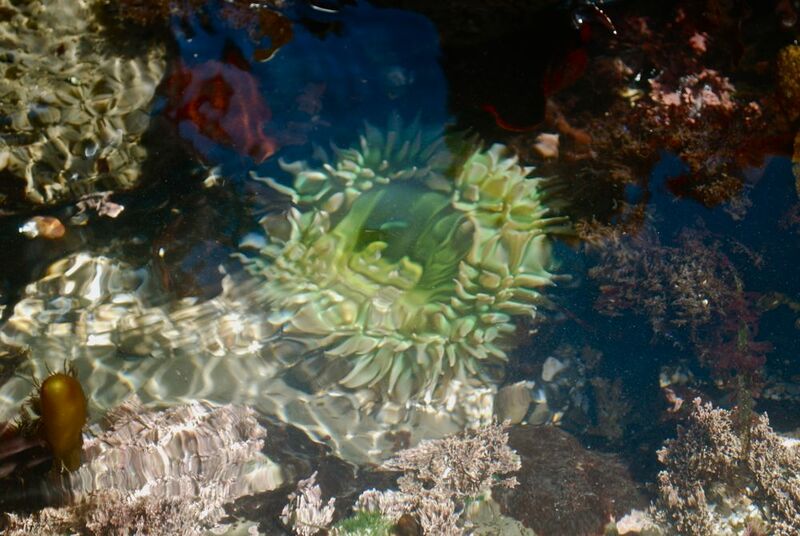 Even now, I still love the excitement and anticipation of what the tide pools hold. This trip we took a new gadget. I'm told it's a snipe. It's made of 4" pvc tubing with a 1/4" acrylic bottom that serves as a window. It was given to D by a colleague of mine. You simply dip the tube in the water and explore the bottom. I'm also convinced that it acted as a microscope, enlarging whatever was in the viewing window. I'll never leave home without this when headed to the beach! Super fun. More pictures of our discoveries below. That's a sea anemone! It's a medium sized green anemone. It's fun to touch the tentacles and see the anemone close around your hand. 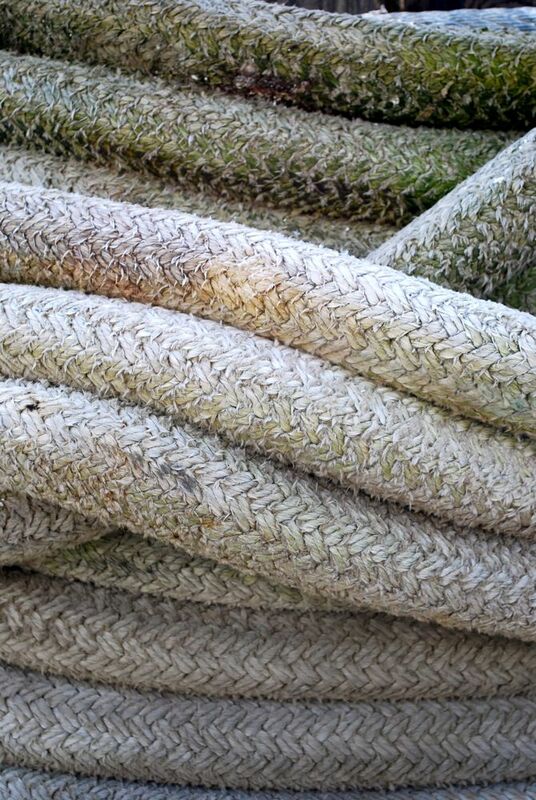 You can even feel the resistance of their sticky, stinging tentacles. Don't worry, these guys won't harm humans. D spotted the only urchin of the day. Urchins are my favorite. Their color and shape mesmerize me. These guys are hard and pointy, but still fun to gently touch. 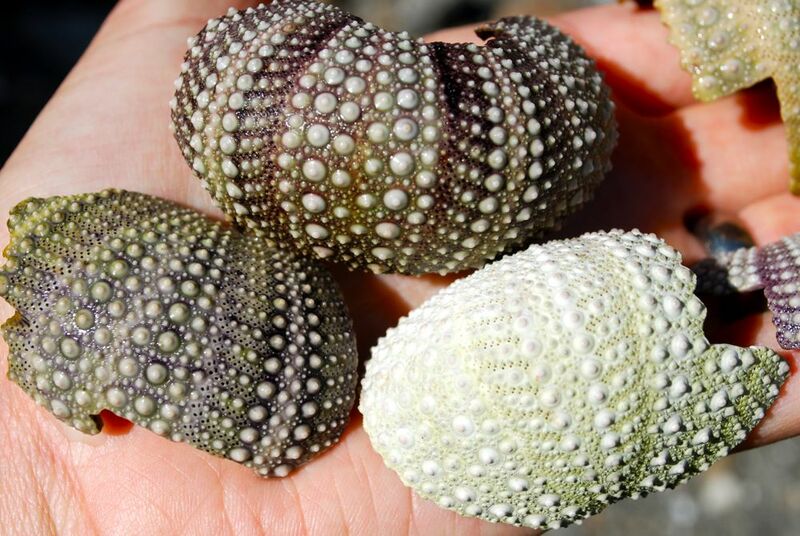 Sea urchin shells. These were all over the place, in the water and on the beach. I find these even more beautiful than the creature itself. Nice variety of color and textures. Interesting find. 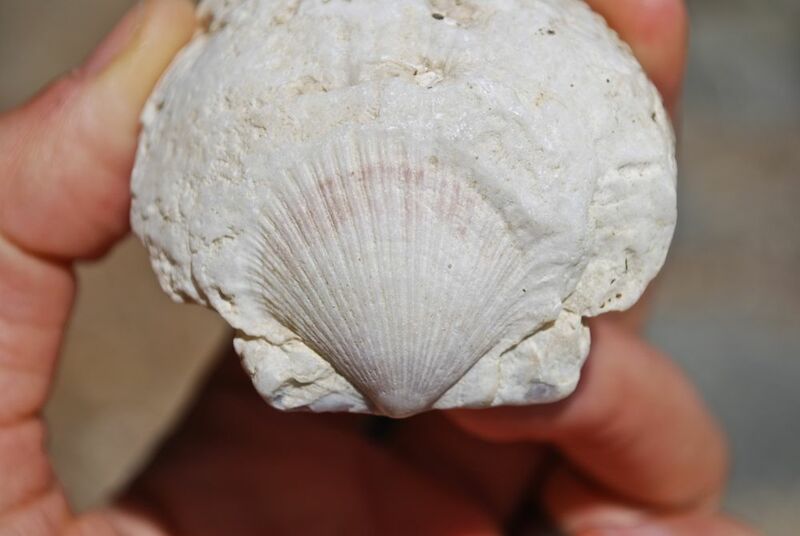 It looks like a little clam was growing on old, empty clam shell? The faceted thing in the middle of the picture is a chiton. I thought it was a fossil because it looked like stone, but Doc quickly corrected me. It was pretty big, about 4 inches long. 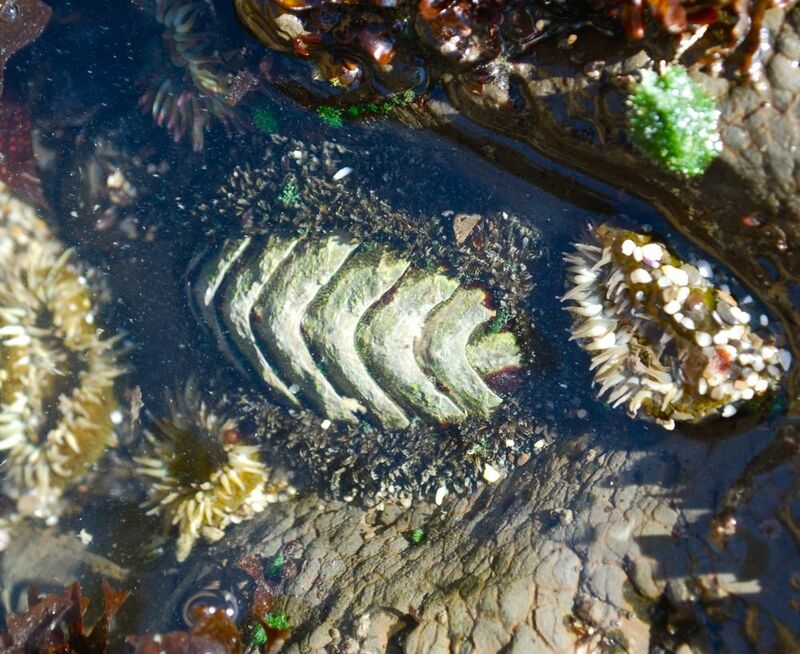 Chitons are really cool and there is a large variety. More research on these guys is in order. TIPS: If you go, make sure to check the tide tables or tidelogs to ensure you'll be able to see the pools while the tide is low. Also, go the website, http://www.fitzgeraldreserve.org/ for more information. Make sure to wear shoes you can walk and climb around in and you don't mind getting wet. Rain boots, rubber boots, water shoes I highly recommend. Also, while you can bring chairs and towels, there is very little beach and the sand is very coarse. I think this is more of an exploring beach than lounging. Either way, it's still beautiful and inspiring. Since summer break is fast approaching, I'd like to share some of our favorite activities and destinations around town. This city has a lot to offer resident and visiting families. 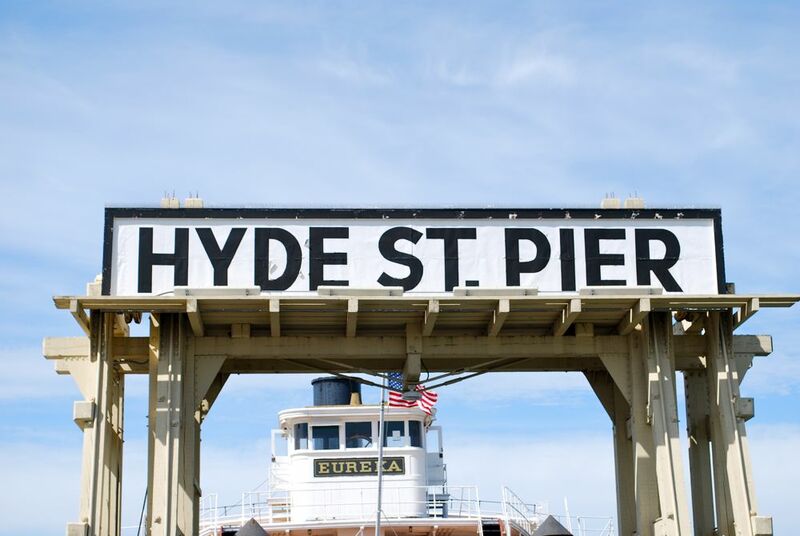 First up is Hyde St. Pier, located next to Aquatic Park and Ghiradelli Square. It was the main automobile ferry pier before the Golden Gate and Bay Bridge were built. Now it's home to the San Francisco Maritime National Historical Park. 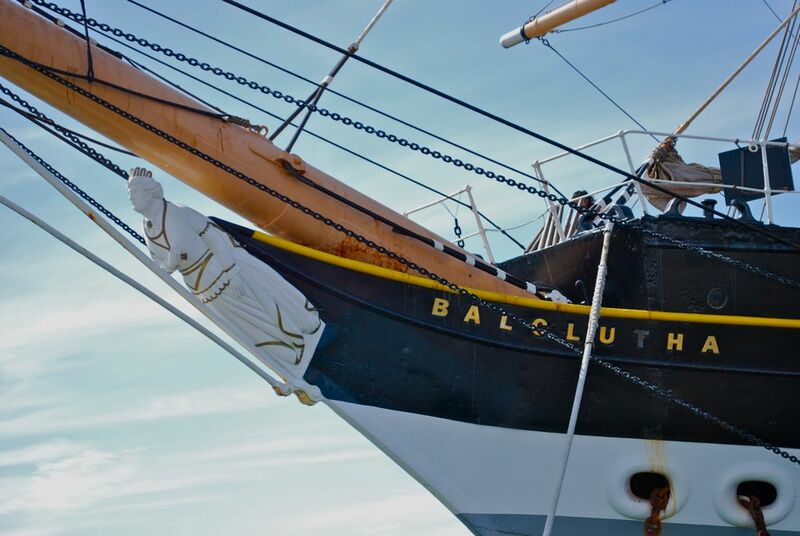 This is a great place to explore and step back in time as you board a historical cargo ship, ferry, tug boats and more. These were all taken on the Balcutha, a cargo ship born in Glasgow in 1886. It has a great multi-media exhibit below deck which includes recreated cargo she once shipped. I'd love to have a party on this boat! Apparently, school groups do sleepovers and simulate running the ship. Sounds like fun. The steam powered tug boat, Hercules, is super fun to climb through. You can see down to the steam engine over an open grate which is a bit unnerving for some. This ferry, the Eureka, is my favorite. The exhibit of the old cars is fantastic, and the restoration is inspiring. TIPS: If you go, pack a picnic and extra clothes. 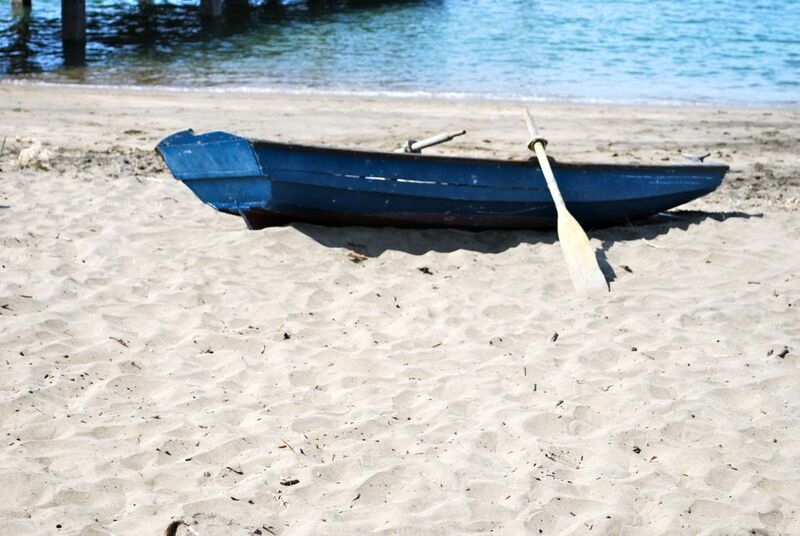 You can have lunch on the beach and play in the sand, weather permitting. Even if it's blustery out, you'll still see children running and splashing in the water. And you can wrap up your field trip with a walk over to Ghiradelli Square and treat yourselves to something sweet and chocolatey. Geez, I'm a bit embarrassed about my previous declaration of re-entering the blog world only to be absent for another month! It's safe to say, I've made it over the hump with all the goings on in our life. First off, we closed on our house and we are moved in! We've been in our new residence now for two weeks, and it's beginning to feel like home. Surprisingly! We were unsure how we would adjust to living in an old Victorian after loft living for 12 years, but the transition has been smooth and enjoyable. Instead of plywood floors, an open floor plan, no closets, no doors, and an industrial neighborhood, we have discreet rooms, plenty of closets [usable closets too! not odd left over spaces that can't even accommodate a hanger], doors for some much needed privacy, a garage and a composting bin! I've come to realize residential living is so civilized. I'm excited by our new neighborhood and all that it has to offer. It finally feels like we're living IN San Francisco as opposed to the outskirts of San Francisco. The one thing I do miss is this view of downtown. So I'm pleased to report that my letterpress class was wonderful! I learned the basics about letterpress and its history thanks to a short "lesson" and handout prepared by Jordan. After our intro, Jordan gave us a demo on the machine, and then each of us cranked out - literally - forty proofs of all of our cards. With Jordan's permission, I snapped a few shots of her studio. Thanks to a generous classmate, I was FINALLY able to taste Tartine's morning bun! WOW, WOW, WOW!! I was pleased that my thumbnail sketch took to the process nicely, but I was disappointed in my selection of typography. I think with a few adjustments, it'll get to a place where I'll be happy. But I had a great time anyhow! I had several other layouts, but after some input from Doc and friends, I landed on these. Typography is soo hard and challenging. I'm not cut out for the nuances and finesse it requires. I'm really hoping the sketch comes through; keep your fingers crossed! I'll share the results! Isn't Spork an excellent name for a restaurant? I think so! 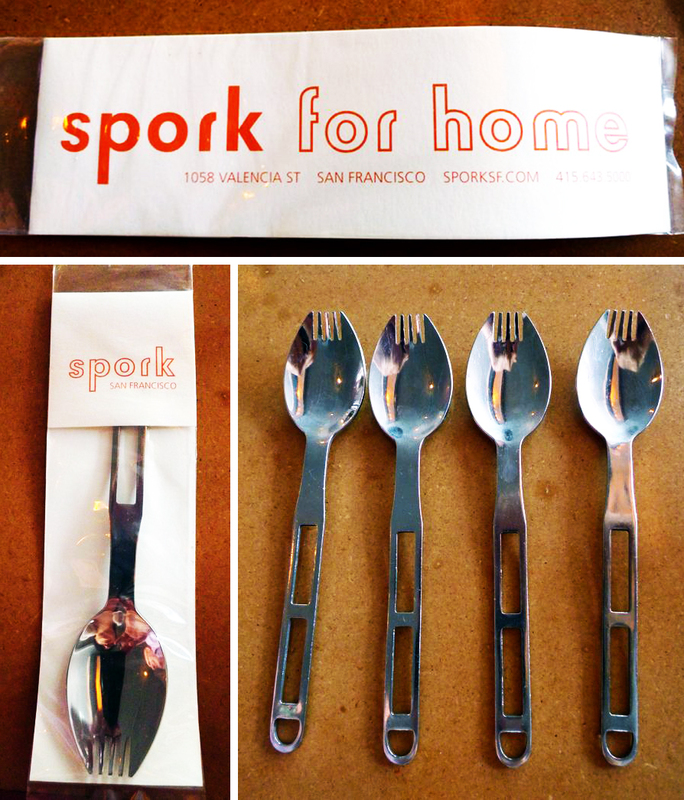 Spork is another of our favorites. Like the utensil it's named for, Spork is simple and clever. Located in the Mission and occupying a former KFC, Spork really delivers on food, service and environment. Super tasty and yummy food aside, the interior is what I enjoy the most. It's a great example of a project that was executed on a small budget [intentional or not], but delivers big on impact! Until you visit, I'll share some pictures. Does that form look familiar? Yep, it's an ashtray filled with butterscotch pudding. It was much more appetizing in person. Despite the ashtray, our party finished the dessert in record time. As much as I like concise, focused entries, sometimes there is a need to "unload" random bits of information. So here it goes! For the SF and Bay Area locals… San Francisco Sunday Streets are back. If you didn't have a chance to participate last year, make sure you do this year! Bring your bikes, skates, sunscreen, kids, pets and cameras and enjoy traffic free streets. Riley G Strapworks…camera straps rock! I received my handmade Speed Racer strap last week and immediately put it to work. Now, I've got my camera ready at all times while out and about, and I don't worry about looking like a tourist with my new strap. Follow his journey of building Riley G Strapworks into a business and see his photography portfolio on his blog. His photography style makes me want to bring the whole family to SD for a photo session! And speaking of photos…I've uploaded several new albums to the Photo Gallery link, including one for aprons. Please take a look. 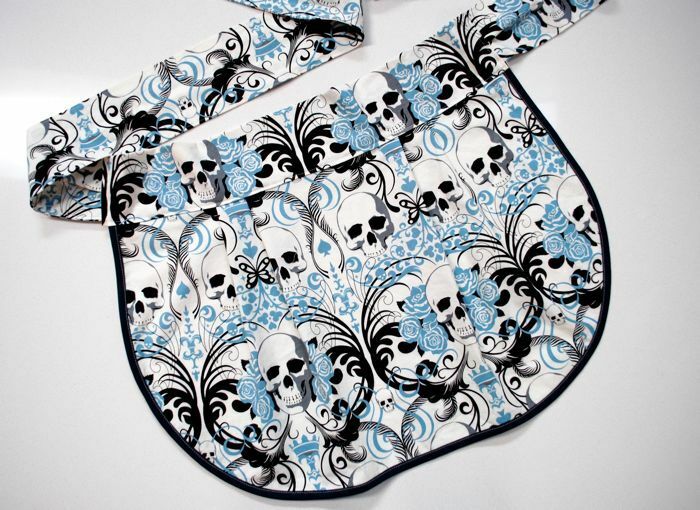 The thumbnail to the left features my new favorite apron made from Henry Alexander Regent Skull fabric. I hope you enjoy perusing the pictures and check back frequently as I plan to continually add more photos. New Neighbors…are popping up at the Purl Beehive. I know most of you found your way to F&N through the Beehive and visit all the other wonderful blogs in this creative blog community. For those of you who haven't visited the Beehive, the Beehive icon in the sidebar will get you there. THANK YOU…to everyone who checks in and reads the blog. I love all the comments, so keep them coming! The sunny, warm weather inspired us to head out to the flea market on Sunday in search of treasure. With an open mind and wide eyes, we rummaged our way through our small but abundant flea market. Here are the goods that came home. Some adorable vintage toy cars that were still overpriced even though I bargained them down to half price. These caught my eye because of their graphics and color. 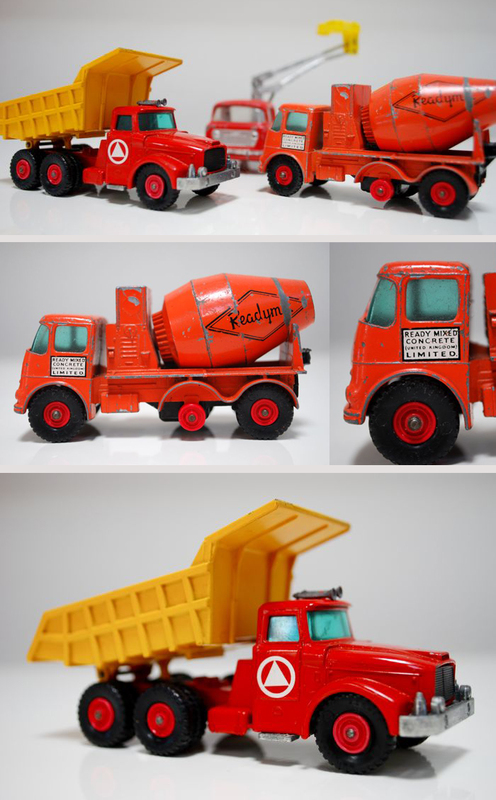 Check out the typography on the cement mixer… just don't make `em like that anymore. These precious puppet heads in a box full of doll parts were spotted by Doc. D calls them Lolo & Lola. Now that Spring has arrived, I look forward to hitting the flea market on a regular basis and scooping up overpriced ephemera!